In this book I offer rave reviews of 150 great true films. I define these non-fiction films as true films — documentaries, educational films, instructional how-to’s, and what the British call factuals – a non-fiction visual account. 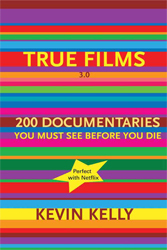 The 150 films included in this book are the best non-fiction films I’ve found for general interest. I haven’t had TV for 20 years, so I’ve concentrated my viewing time on documentaries and true films. I run a little website (www.truefilms.com) where I solicit suggestions of great stuff. So far about 40,000 documentaries and factual films have been released. There’s no time to watch them all, and little guidance to what’s great. I’ve watched all these films more than once. Sometimes thrice.This little book will steer you to the best true films in English. Each film gets a short review of why it is worth your time, and then I feature 4 or 5 screen grabs from the film to show you what the texture and style of the film is. I also include a picture of the cover and indicate where you can rent it (say on Netflix) or purchase it (from Amazon). All the films reviewed are available on DVD or tape at consumer prices. This is the golden age of documentaries. Inexpensive equipment, new methods of distribution, and a very eager audience have all launched a renaissance in non-fiction film making and viewing. The very best of these true films are as entertaining as the best Hollywood blockbusters. Because they are true, their storylines seem fresh with authentic plot twists, real characters, and truth stranger than fiction. Most true films are solidly informative, and a few are genuinely useful like a tool. What am I looking for in a great true film? It must be factual. It must surprise me, but not preach to me. If it introduces me to a world or subculture that I never thought about before, even better. There’s a plot – a transformation from beginning to the end. It’s easily available. Enjoy the best!